Is it just me, or are the weeks just flying by? I always get this feeling in March, I think it has to do with the fact that February is such a short month. One good thing about time flying, is that spring is almost here! I really can't wait for some sunshine. But as it's still cold and wet outside, I decided to go for a dark, vampy color on my nails. 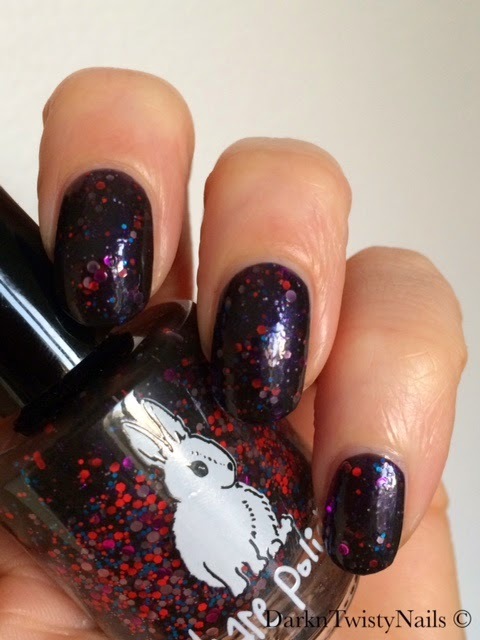 Hare Polish Attack of the army from Albiorix is a very deep and vampy purple jelly base with a mix of fuchsia and pink small circles, bright red glitter, bright blue glitter and purple shimmer. This base is so dark, it looks black most of the time, but when you paint it, you do see it's actually dark purple. This collection has a full-on-galaxy-war type of vibe, and was born from my affinity for 1960's/70's pulpy/sci-fi art. Imagine warring armies from enemy galaxies destroying whole planets with laser cannons and giant space robots from the nearest black holes - these were the types of things floating through my brain while making this collection! The formula was excellent, the first coat was a little sheer because of the jelly base, but it was fully opaque in two. The glitters came out easily and spread out on the nail nicely. 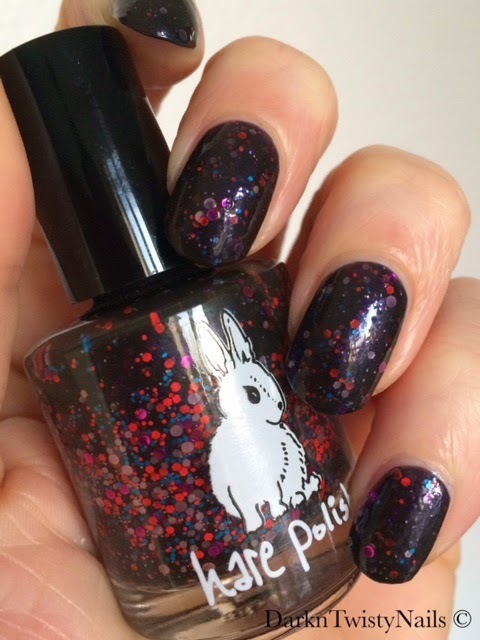 This polish dries just as fast as any other Hare polish, but it wasn't very shiny, so I would suggest a good, thick layer of topcoat to get a shiny finish. I love this color and this polish was the reason I wanted this collection in the first place. Deep, vampy base with a multi colored mix of glitter, everything I want in a polish and with a perfect formula to top it off. I'm a big fan! 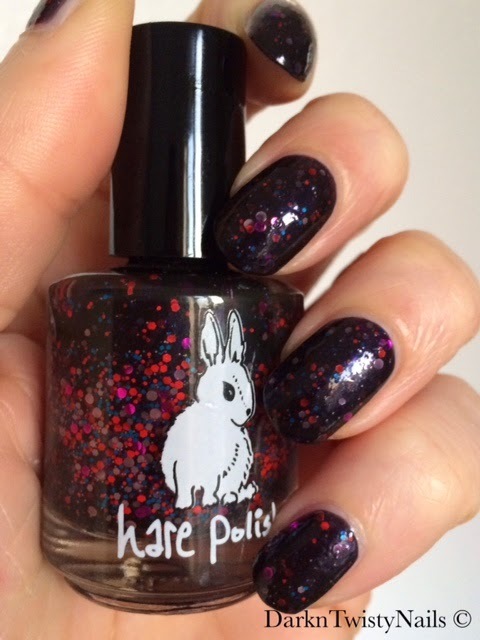 Hare Polish is available on Etsy, her stock tends to sell out quite quickly, so keep an eye out for restocks! 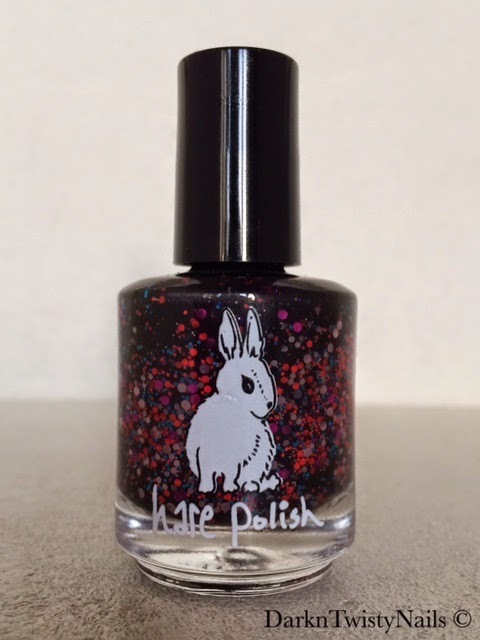 What's your favorite Hare Polish? Wat is ie leuk! Apart en cute! Ik vind 'm echt héél erg gaaf! Te donker voor mezelf, maar bij jou vind ik 'm fantastisch! Toch denk ik dat hij jou best gaaf zou staan!